On Computers » BRING TIM! 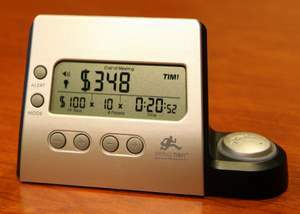 “TIM” stands for “Time is Money,” and “Bring TIM!” is a small meter that ticks off the cost of a meeting in progress. It’s easy to set up. The default setting is $100 an hour per person for a ten-person meeting. We changed it to $40 an hour by pressing a “minus” button that shifted down in $5 increments. Then we pressed a different button to bring the number of attendees down to seven. Even then, it was shocking to see that in less than five minutes we’d already wasted $23. We weren’t even finished clearing our throats. The only drawback is the tiny size of this thing. You’d have to be sitting right next to it to see the cost ticking away. We’d like a huge one that could be seen from across the room. Bring TIM! is $25 from bringtim.com.